We are pleased to announce the release of a new paper: Population Structure for Sea Turtles at Drini Bay: An Important Nearshore Foraging and Developmental Habitat in Albania, by M. White, L. Boura and L. Venizelos. 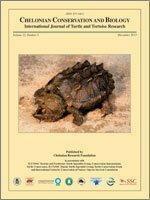 The paper was published in December 2013 in the Chelonian Conservation and Biology journal, Issue 2 of Volume 12 (pp. 283-292). For a preview click here. To download the full article click here. This paper stems from the 3-year collaborative project that we implemented in 2008-2010 to monitor sea turtles in Drini Bay, Albania. It follows several previous papers and reports presenting project results. This paper provides a method of utilising morphometric data to understand population structure and a practical way of identifying the development of secondary sexual characteristics from external features, combining carapace and caudal measurements. We take the opportunity to once more acknowledge and thank project partners and funders. Following this project, in 2012 Albania adopted a national sea turtle action plan which MEDASSET prepared in consultation with experts, the country continues working to protect sea turtles through policies and projects such as NETCET, and several students trained via the project have also followed careers in sea turtle or environmental research and conservation. Loggerhead sea turtles Caretta caretta using an important shallow-water foraging ground at Drini Bay, Albania, were monitored over 3 consecutive summers (2008–2010). Working closely with local artisanal fishermen, researchers were able to obtain many of the sea turtles captured as bycatch (nontarget species). There were 407 new records (402 loggerhead and 5 green turtles, Chelonia mydas), with most (99%) being captured in 2 stavnike fish traps (a type of pound net) and a few with mrezh (gill nets). Morphometric data were collected from all captured turtles, and they were allocated into 10-cm size classes (length-frequency-distribution) based on their curved carapace length; caudal measurements were used to assess the developmental-stage of secondary sexual characteristics. An unusually high number of male loggerhead turtles (27%) were captured; their morphometric data were subsequently used as a reference for determining if short-tailed turtles might be adult or sexually developing females. Nesting has not been reported for Albania, so the presence of females is unclear. Drini Bay is also a developmental habitat, as 69% of the studied turtles were yet to mature. Interannual recaptures of 26 turtles allowed their incremental growth rate to be calculated. Received: March 4, 2012; Accepted: December 27, 2012. The project was co-funded by MEDASSET, the Global Environment Facility’s Small Grant Programme (GEF/SGP), the United Nations Environment Programme-Mediterranean Action Plan (UNEP/MAP), the Regional Activity Centre for Specially Protected Areas of UNEP/MAP, the British Chelonia Group, the J.F. Costopoulos Foundation (Greece), the Spear Charitable Trust (UK) and the Panton Trust (UK). Project partners included the University of Tirana, the Herpetofauna Albanian Society and ECAT Tirana. MEDASSET wishes to acknowledge the role that Prof. Dr. Idriz Haxhiu has played in first establishing sea turtle research in Albania; and thank him for co-ordinating national logistics for this project. The authors thank the following for their support: Arian Gace, Xhevat Gërdeci, Esmeralda Kararaj, Marina Mitro, Dhurata Përkeqi, Lazjon Petri, Prue Robinson, Enerit Saçdanaku, and Bekim Trezhnjevna. We also thank the fishing community in Albania for their collaboration; Robert van Dam for his photo of male hawksbill turtles; Daniela Freggi for providing access to turtles at Centro Recupero Tartarughe Marine Lampedusa, Italy; www.seaturtle.org for the use of MapTool; and finally to the anonymous reviewers whose comments considerably improved this manuscript.